What is AirAdvisor and what do we do? We plan to introduce new service to the market soon – to claim a refund of airport taxes and fees paid in case of “No Show” (when an air ticket is purchased, but the passenger did not use the flight service). you e-sign Certificate of Authority to assign your claim and give us the authority to represent you. If your eligibility is confirmed, then our team will immediately start working on your behalf, submit the complaint to the airline and will even take the airline to court, if necessary. No Upfront payments and we work on “No Win No Fee” basis. We charge only a small commission withheld from compensation payout and only if compensation is received. As soon as we receive your compensation you will be notified. Then you instruct us on how you want to get your money and that is all. Why should I use AirAdvisor instead of making a complaint myself? You can try to hire an expensive lawyer (paid on an hourly basis) or get compensation yourself and our website even contains tips for you about how to do this. However, while this may seem easy to do, unfortunately, it is not. Airlines intentionally make it very difficult for passengers to claim compensation. That is the reason why only 2-4% of people actually submit a claim for flight compensation and even less percentage actually succeed in finally receiving any payout or agree on food vouchers. Some cases can take up to a year or longer. There are jurisdictional issues (passenger is residing in one country and the airline is based in a different country) and issues of material law when an airline seeks an excuse to avoid a payout. Honestly speaking, no one hires regular lawyers for individual cases for economic reasons. Some people try to deal with airlines yourself but only 2% succeed and it usually takes much longer and chances to success are lower. (vii) AirAdvisor has a profound experience. For example, when we know that complaining to a relevant aviation supervisory authority will not have any effect on the airline, then we skip this stage and go directly to the arbitration or court. We do this because our goal is not to go through all available stages of complaining, but to get you compensated as soon as possible, unlike traditional lawyers who would charge an hourly fee and are interested in having a long pending case. Overall, it is time-consuming and in many cases requires dedicated work of a legal professional to make sure compensation is successfully claimed and received. Can AirAdvisor help if my claim has been already rejected by the airline? Submitting a claim to the airline is the only first step in a chain of bodies, arbitrators and courts we can address your case to. So when AirAdvisor is working on a case and if we receive a rejection, it does not even get us upset because we have a large set of tools to make the airline change its mind. For example, as soon as AirAdvisor receives a rejection it immediately addresses the case to a relevant aviation supervisory body, so it conducts the independent review and inspection of the case and airline in general. How much does AirAdvisor service cost? Our fee is 25% of the compensation collected, which is deducted from the money that the airline has paid. This means we do not get paid if you do not get compensated. We deduct our fee when transferring money to you, so you do not need to make any actions incurring transaction costs to make a payment to us, we will arrange it for your convenience. What documents should I provide to AirAdvisor? (iv) confirmation of the delay or cancellation provided by the airline (if possible, e.g. statement or email received from the airline itself, or from the airport, and so on). I am using AirAvisor already to complain, but the airline contacted me personally. Can I withdraw my case with AirAdvisor? Yes, you can withdraw your power of attorney by which you authorized us to claim compensation on your behalf. But in this case, we will have to invoice you for the work already done by AirAdvisor and such bills should be settled first. Also, we recommend sharing with us any communications to/from the airline for the sake of your own benefit, so we understand the case completely and to avoid overall delay caused by parallel communication and enforcement efforts. Some airlines may try to convince you that your case is weak and your chances are slim in order to push you to accept airline’s low offer to settle quickly. Many customers might want to compromise on “small but quick bite”, but will lose all rights to full compensation (e.g., airline frequently offer food voucher or small credit with inconvenient redemption limitations). The only reasons why airlines are doing that because it cost a small fraction of your compensation and airline can get away with the option of credit or voucher instead of monetary payment. The law is clear as to the amount of financial compensation and it shall be paid in EUR by default. So we highly recommend you delegate this work to us AirAdvisor and let us finish it, so you can receive the maximum allowed and in cash. What are my rights in case of a downgrade on a flight? (iii) 75% of the ticket cost for flights outside the EU of greater than 3500 km in distance (including flights between the European territory of the Member States and the French overseas departments). The Regulation No. 261/2004 is not clear about whether the refund relates to the price of the entire ticket or the segment on which the passenger was downgraded. Using this uncertainty some airlines refund only per downgraded part of the flight. At the same time civil aviation authorities confident that the refund should be calculated out of the full ticket price. Is monetary compensation only one remedy? In case of denied boarding, cancellation and delay, a passenger is entitled to the right of care (e.g. meals, accommodation, ground transportation, 2 phone calls, etc.). 3) starting from 4 hours for all other flights. Notably, the right of care applies even when the disruption is caused by extraordinary circumstances. The airline paid me a refund for my ticket. Do they still owe me compensation for flight disruption? Yes, a compensation provided by the Regulation No. 261/2004 is not the same as a refund. You are entitled to both, provided airline has not offered re-booking to you and you have not agreed to that. Example: your flight from Frankfurt to Moscow has been cancelled and the airline has either (i) offered re-booking, which you did not agree upon, or (ii) has not offered re-booking at all. In such case each passenger has the right to seek a refund of ticket price paid (including, airport taxes & fees) and claim financial compensation (here 400 EUR). In case of a non-refundable unused ticket, you are entitled to get the airport taxes & fees refunded. In some cases even price of the ticket (airfare) can be claimed back less penalty for No Show, this depends on each particular ticket and booking rules and is airline specific (some low-cost airline may have no refund policy). If you have “No Show” case you should check with us as we may offer this service a bit later, provided enough customers need this help. Can an airline demand payment in case of an unrequested upgrade (no seat in economy class)? If a passenger is placed in a higher class than that for which a ticket was purchased, an airline has not right to request any additional payment or otherwise increase the airfare. Are airport taxes & fees refundable? Airlines collect airport taxes from air passengers on behalf of airports. A passenger is obliged to pay these taxes & associated fees only when the passenger took his flight. Otherwise, taxes shall not be levied & payable. Therefore, you can request an airline to refund you with taxes you already paid for a flight you did not take. If you have “No Show” case you should check with us as we may offer this service a bit later, provided enough customers need this help. Should I be compensated for accompanying expenses like accommodation, transportation, meals, etc.? These expenses must be reasonable and shall be compensated by an airline. You can claim such reimbursement by lodging a separate complaint with the airline. AirAdvisor does not currently deal with such cases, but if you need our help with such type of cases, feel free to contact us for tips/guidelines. In other words, the flight compensation as per the Regulation No. 261/2004 is not a replacement for such mentioned expenses. AirAdvisor considers adding this as additional service at later date. Does payment of compensation under the Regulation No. 261/2004 replace other entitlements (refund, hotel stay, etc)? No, payment of flight compensation is strictly a compensation for the customer's inconvenience & time lost (in addition to other rights a passenger might have) and does not replace or form a part of ticket refund and/or other reimbursements of legitimate expenses (hotel stay, meals, transportation, 2 phone calls), which a passenger has rights to and Airline must provide this to affected passengers free of charge under the Regulation No. 261/2004 or otherwise. If I’m travelling with young kids and infants? Can I claim flight compensation on behalf of a child? The Regulation No.261/2004 does not specify peculiarities for passengers of different age. Even a newborn is entitled to compensation. The only requirement is that every ticket has to be paid by a passenger. So when children don’t travel free of charge, then they are eligible for the compensation, and vice versa. If you have not paid airline airfare, but only paid airport taxes and fees, unfortunately, compensation will not be available for such infant. Example: Family of 2 adults and small daughter Emilie of 5 years old and small 6 months old infant Aleksandr are travelling on affected Air France flight (delayed or cancelled) Mumbai – Paris – New York. In this case the family paid 2 full fare tickets for adults, one toddler ticket, and likely paid only airport taxes/fees for an infant (unless separate seat was purchased), hence 3 people will have the right to compensation 3 * 600 EUR each total would be 1800 EUR. Of course, a child cannot represent himself before the airline, authorities, and courts. So a claim on behalf of a child should be made by the child’s authorized representative (parents, custodians, etc.). You may be requested to submit a proof to confirm your relationship and/or authority to act on behalf of such child to the satisfaction of AirAdvisor. I travel with family, can I claim for family members as well? Yes, but you have to provide us with proof of authority/consent of your fellow passengers to do that. Please note that flight compensation will be paid to each passenger account even if you paid for tickets for your family unless proof of authority or assignment of payment is specifically furnished to our reasonable satisfaction. Can a Group Travellers claim compensation? Can I be a lead passenger for the group (other fellow passengers)? Yes, you can claim for yourself and for your fellow travellers, but you have to confirm that you have authority /consent of your fellow passengers to do that. If you wish to act as the lead passenger for a group of travellers (other fellow passengers), then we will still need each individual fellow passenger to sign their own copy of our Power of Attorney & Assignment of Claim. Please note that flight compensation will be paid to each passenger account unless proof of authority or assignment of payment is specifically furnished to our reasonable satisfaction. Can Airline insist on giving me Credit or a Travel Voucher instead of compensation? An airline cannot force you to accept a travel voucher or airline credit. You are entitled to request a bank transfer. The Regulation No. 261/2004 provides that “the compensation referred to in paragraph 1 shall be paid in cash, by electronic bank transfer, bank orders or bank cheques or, with the signed agreement of the passenger, in travel vouchers and/or other services”. I complained to the airline but got no reply? What is next? There are many passengers experiencing difficulties and frustration dealing with airlines and getting any response, not to mention obtaining positive resolution of individual claims and receipt of financial compensation. Hence, we recommend you entrust this hard work to AirAdvisor professionals to take the case of this headache for you. When you do not receive a feedback from the airline within 6 weeks, depending on the case at hand we may complain about this to an aviation supervisory authority, which your airline is subjected to, or may go directly to arbitration or court. This all depends on the airline concerned and our experience with this airline. It is not in our interests to go through all available stages of complaining but to get you compensated the maximum afforded by law and as soon as possible. My flight is operated by several airlines. Who should I complain to? Sometimes the airline operating the flight may not be the same as the one from which you bought your ticket. Remember that only the airline, which operates a flight can be held responsible (i.e. operating airline). After checking my flight I receive a notice that my compensation is only 50%. Why? What about air miles – Can I still claim flight compensation if I used air miles for the ticket? The answer is Yes. The Regulation No. 261/2004 requires that every ticket be a paid ticket, it does not specify a currency or method a passenger should pay for a ticket. So if you used your air miles to get a ticket, then you are eligible for the flight compensation. If I got a ticket as a gift (family member or friend paid for my ticket), can I claim flight compensation? Yes, any passenger whose flight was delayed, cancelled, or who was denied boarding, has a right to compensation regardless if he paid for the ticket or somebody else paid for it, except for a business travel paid for by a company and where it is specifically addressed in the contract between the passenger and employer. Can I claim flight compensation, if somebody else paid for my flight? Pursuant to the Regulation No. 261/2004, the claimant is always the air passenger regardless who paid for the ticket and nature of air travel. The Regulation No. 261/2004 is designed to compensate delayed passengers for their loss of time and inconvenience – not to reimburse them for the cost of the ticket. Hence, the person who paid for the ticket cannot claim flight delay compensation; only the person who was travelling is entitled to claim. Therefore, a person who paid for a ticket but is not a passenger is not entitled to compensation. There could be only one exception when there is an agreement or another document between a passenger and purchaser of a ticket, which transfers such rights to the actual purchaser from a passenger. Can a businesses traveller claim compensation if the company or third party paid for his flight ticket? Pursuant to the Regulation No. 261/2004, the claimant is always the air passenger regardless who paid for the ticket and nature of air travel. The Regulation No. 261/2004 is designed to compensate delayed passengers for their loss of time and inconvenience – not to reimburse them for the cost of the ticket. Hence, the person who paid for the ticket cannot claim flight delay compensation; only the person who was travelling (or was to travel) is entitled to claim. There could be only one exception when there is an agreement or another document between an employer and employee providing for the employer’s right to compensation instead of the employee. Am I entitled to compensation for a missed connecting flight? Yes, you are entitled to compensation for a missed connecting flight even when you missed a connection or were delayed at any part of the journey for less than 3 hours leading to your overall arrival delay at the final destination airport for 3 hours or more. When can Airline avoid paying compensation? What are Extraordinary Circumstances? 2) security risks, unexpected flight safety shortcomings and only external strikes (e.g., air traffic controllers strike) that affect the operation of an operating air carrier. HR/Staff problems of the airline and an internal airline strike are not extraordinary circumstances and do not release an airline from liability to pay the compensation. 3) a claim is also barred by the statute of limitations, which is country specific (e.g., it is 10 years from the arrival date in Italy and 6 years in the UK) and the Regulation No. 261/2004 is silent on this. Is airline strike an extraordinary circumstance? No. For example, Air France pilots' strike is an internal strike. Therefore, the airline cannot lawfully refuse to pay passengers the flight compensation provided by the Regulation No. 261/2004. Do technical issues exempt airlines from liability under the Regulation No. 261/2004? There are already a number of court precedents explaining that technical issues do not exempt airlines from compensating passengers on the reason that the maintenance of planes is a normal obligation of airlines and has to be done on a regular (daily) basis. In rare cases a technical issue may be an excuse only when an airline took all reasonable and possible measures to prevent such events. For example, an airline installed a new detail that failed due to a defect made by the manufacturer. Does the Regulation 261/2004 apply to UK airlines after Brexit? As of now, the UK is still bound with most of EU regulations, including the Regulation No. 261/2004. If and when this changes, we will let you know. What is arrival time: landing or when airplane doors are open? In September 2014, the Court of Justice of the European Union made a ruling on Case C-452/13 regarding the definition of the arrival time of a flight. The Court ruled that “arrival time” used to determine the length of a flight delay means the time when one of aircraft doors is opened, as only since then a passenger can physically leave an aircraft. What is the "Final Destination"? ‘Final Destination’ means a destination on the ticket presented at the check-in counter, or in case of directly connecting flights (purchased as one itinerary, not separately purchased tickets) - a destination of the last flight. Please note that the Final Destination is always used for purposes of calculating a flight distance regardless if you have connecting flights or not. Example: you are travelling from Paris to New York with a connecting flight in London. Your flight between Paris and London is cancelled. In this case, when determining your flight distance, New York is the final destination and distance is measured between Paris and New York despite that you never reached the United States. Another example: if you are flying from Moscow to New York through the first connection in Istanbul and second connection in Paris, then Final Destination will be New York and delay in New York will be calculated for purposes of flight compensation (distance between Moscow and New York will be considered for this purposes). The important consideration that the ticket must be purchased as one single ticket, not as separate tickets in which case the distance will be measured as per each separate ticket. To check a flight distance of your flight you can use a number of services available on the Internet (e.g. www.distancefromto.net), however, our website will do it for you, so you don’t have to worry about it. What is a booking reference number (PNR) and where do I get it? A booking reference number is also known as the booking code, or reference number, or Record Locator, or PNR (Passenger Name Record) and it is available on your booking confirmation (e-ticket). It is usually a combination of 6 to 8 letters and/or numbers (e.g., GVZL5S or 49617966). What is a flight confirmation (e-ticket or ticket reservation) and where do I get it? When you purchase a ticket your airline sends you via email confirmation of the purchase. In most cases such confirmation looks like a ticket or a summary in email or email attachment and contains information about your flight such as flight number, dates and time of arrival/departure, name, etc. Our fee does not include court fees and other direct disbursements, which a claimant has to pay in case of litigation (arbitration/court expenses, all together referred to as the “court costs”) regardless if you complain yourself or AirAdvisor does it for you. We pay all these expenses and deduct court costs together with our fee at payment of collected compensation to you, all for your convenience. How much will it cost me in total to collect compensation? Court fees and other disbursements depend on the arbitration and court that the airline is subjected to. So answering this question it is impossible to provide you with some unified sum. But in any event, it should not exceed half of the compensation, in most cases it will be an insignificant amount. How do I get paid my compensation? The most popular payment methods to receive money are a regular bank transfer, PayPal, Payoneer, Transferwise. However, if you would like to get paid off via another payment service, then just let us know and we will try to arrange this. AirAdvisor will offer you the most cost efficient method of paying out, but you are free to decide otherwise. The best case scenario is when your airline agrees to compensate you. Usually, it takes up to 6 weeks. If you do not receive a feedback from the airline or the airline rejected your complaint, then we switch to other stages of complaining. In this case, the whole process could take up to a year because aviation supervisory authorities, arbitrations and/or courts may ask for additional documents, assign an expertise to be conducted, be overloaded with other cases (seasonal backlog of cases). Time is money for us. So we are not interested in going through all available stages of complaining. Our aim is to get you compensated the maximum and as soon as possible. Which law provides for flight compensation? 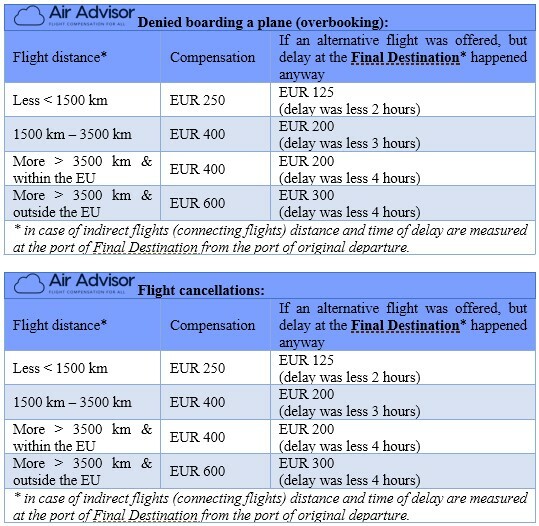 The European Union Regulation (EC) No 261/2004 of the European Parliament and of the Council of 11 February 2004 establishes common rules on compensation (sometimes referred as “Flight Compensation Regulation 261/2004”). The Regulation No. 261/2004 sets common rules on flight compensation and assistance to passengers in the event of flight cancellations and denied boarding (including overbooking). It provides for flight compensation from €250 to €600 depending on the flight distance. Court of Justice of the European Union has interpreted passenger rights strictly and in favor of passengers so that there are virtually no exceptions for airlines to avoid obligations for breach of contract. In the case of TUI Travel v. Nelson, the Court of Justice of the European Union ruled that passengers, whose flights are delayed more than 3 hours shall have the same rights to compensation as ones whose flights are cancelled. The Court noticed that a delay leads to similar consequences as flight cancellation. So after that court decision, passengers whose flight is delayed for more than 3 hours have a right to the same compensation under the Regulation No. 261/2004. 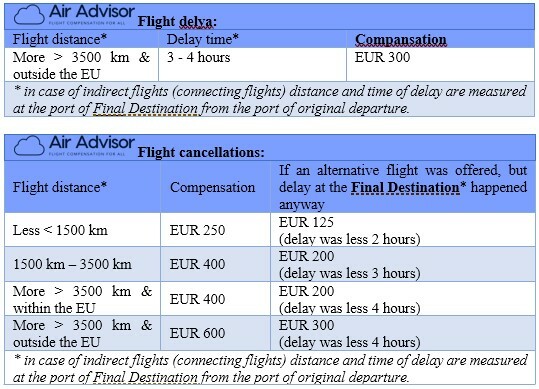 Which flights are eligible for compensation under the Regulation No. 261/2004? from Non-EU country to EU country (flight departing from a non-EU member state and arriving in any EU country on a flight operated by an EU licensed Airline). 3) flight shall meet time limits for bringing court claims, which are EU country-specific (EU countries, as usual, allow recovery for EU flights up to 3 years old, but some countries allow even older flights claims, e.g., UK allows to claims for flights up to 6 years old). The Regulation No. 261/2004 does not set a time limit on how far back claims can go. There is no unified time limit for all EU countries. Hence time limit for flight claims is specified in national laws of the country where you bring the claim (European Court of Justice, Case C-139/11 dated November 22, 2012). Generally, in majority of countries passenger can claim compensation for flights dated 3 to 5 years old, however other countries may have up to 10 years and even longer, so we encourage passengers to submit claims for all pre-existing disrupted flights and we will check it for you and notify you accordingly (you might have hundreds of EUR sitting in your email, so do not lose it). Every EU country has its country-specific time limit. For example, in the UK – time to submit a claim to court is 6 years (confirmed in case Dawson v. Thomson Airways in 2014), so any claims for a flight less than 6 years old shall be eligible for flight compensation. Important that time limit for bringing a claim is calculated from the date of the disrupted flight (date of arrival or scheduled departure in case of cancellation) and NOT until the date of claim submission to the airline, but until claim officially submitted to state court. Hence, it is important that passengers CLAIM FAST on their flights not to lose its rights. Warning, some airlines are actively trying to enter into lengthy settlement discussions directly with passengers in order to delay court filing, so once time has lapsed airline will immediately change its approach and reject passenger’s claim completely without any remedy. Which Non-EU countries are covered under the Regulation No. 261/2004? The 'EU airport' also includes the following countries: Iceland, Liechtenstein, Norway and Switzerland. So the Regulation No. 261/2004 does apply to flights to/from such countries. How can I check whether I have a right to compensation? Our website software instantly checks your flight compensation eligibility for free and lets you know whether you have a right to compensation or not. You just need to enter your flight data on the main page of our website that takes only a couple of minutes. You will get the result instantly. How is a time of flight delay measured? Time of flight delay is calculated from originally scheduled arrival time as per ticket as compared to actual airplane Arrival Time at Final Destination. See below how “Arrival Time” and “Final Destination” are defined.